Here are 2 maps, be right back! Yes, this blog was in a bit of a hiatus. While I put together some more original stuff (and hopefully welcome additional contributors), let me share two maps with you that are pretty cool not just because they are quality products in their own right, but also because of how they were put together. … the Gates Foundation’s Financial Services for the Poor program launched an ambitious geospatial project in Nigeria. 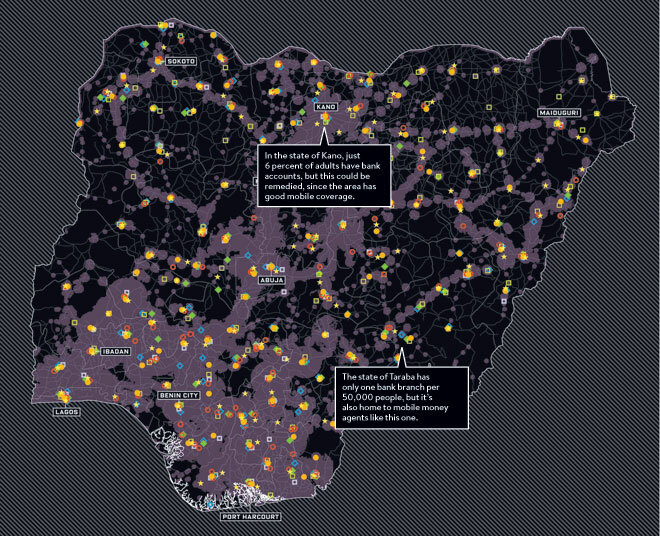 Armed with Black­Berrys and traveling in a grid pattern, 30 surveyors undertook a three-month campaign in Nigeria to pinpoint all of the services available—from bank branches to microfinance institutions to post offices and more. They logged GPS coordi­nates and took photos. … The resulting website gives the best picture yet of how financial services work in a developing economy. Jake Kendall, the Gates Foundation program officer who heads the project, hopes financial institutions will use the map to figure out where to open new locations. It can also guide public policy: Kendall’s team used this map to show the Nigerian central bank governor the need for mobile-based finan­cial services, since it demonstrates that more than half of residents live outside a 3-mile radius of brick-and-mortar options. A good map inspires curiosity. I find myself asking, how do you get to people who do not have mobile coverage? (Those are the non-purple parts.) Mobile money agents are often touted as a great list mile solution – yet, they often overlap with existing infrastructure, and in a fair few cases, are missing where other delivery channels, such as post offices, are present. Are mobile money agents really that redundant? Are there alternative delivery channels for financial services one should explore? 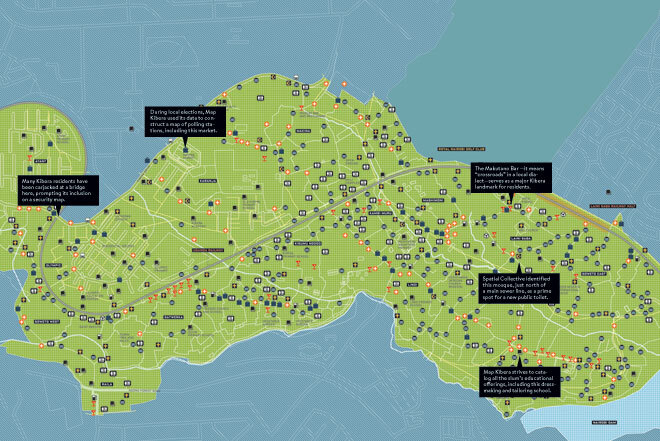 In addition to the ability to provide efficient placement of new services, the fact that this map was crowdsourced is particularly noteworthy. By collecting information deemed useful to the residents of the slums themselves, whatever work done based on this will presumably be more relevant to them. Incidentally, comments in the article suggest that this is built on OpenStreetMaps’ work in mapping Kibria (http://mapkibera.org/) – that in itself is worth checking out.